Then the Blessed One spoke to the Venerable Ananda, saying: “Enough, Ananda! Do not grieve, do not lament! For have I not taught from the very beginning that with all that is dear and beloved there must be change, separation, and severance? Of that which is born, come into being, compounded, and subject to decay, how can one say: ‘May it not come to dissolution!’? There can be no such state of things. Now for a long time, Ananda, you have served the Tathagata with loving-kindness in deed, word, and thought, graciously, pleasantly, with a whole heart and beyond measure. Great good have you gathered, Ananda! Now you should put forth energy, and soon you too will be free from the taints. We shall see that the Mahāparinirvāṇasūtra is not so much a historical record, but rather uses the event as a major catalyst for breaking down the Tathagata-garbha / Buddhadhātu doctrine, the Buddha’s true Eternal Self-Nature and the fate of the icchantikas under a soteriological impetus. In relation to the latter, the earliest version (circa between 416 and 418) of the Sutra by Faxian and Buddhabhadra states unequivocally that the icchantikas can never find salvation, whereas in the later version (circa between 421 and 430) by Dharmakṣema a window of opportunity is left open for the icchantikas to refute their evil ways and reach-out to the Buddhadharma for reformation. All in all, the Mahāparinirvāṇasūtra is an account of the Buddha’s passing over to the Nirvanic Kingdom of Self. Many of the sutras, the Mahāparinirvāṇasūtra certainly being no exception, highlight the Supernal qualities of the Tathagata. 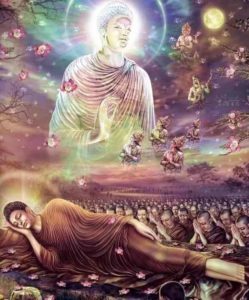 The Buddha is not only superior to all humanity, but also to all variety of beings; this reveals how the Buddha is venerated by both gods and men, signified by all manner of divine beings coming to attend to his dying needs. By his own nature the Buddha is supraworldly—lokottara—just as his Divine Law (Dhamakaya) is manifested in the Self-same Absolute manner. In such means we find echoed throughout the Mahāparinirvāṇasūtra that Docetic-Factor wherein the apparent physical appearances of a Tathāgata are inherently deceptive. A Buddha has no ordinary human embodiment, but rather a most salient transcendent emBODHIment or the awakening of an Enlightened-Spirit. One of the thirty-two miraculous signs is the gilded color of the Buddha’s skin, which is celebrated at different intervals of the text. The rays of light emanating from his eyes and mouth are likened unto a luminous refulgence that fills every corner of the cosmos itself. His sanctity is Self-perfected as he is stripped completely of all the passions and vices that plague mortal man. He has the Beatific Divine Eye that empowers him to view many diverse localities of other divinities that remain invisible to sentient beings. He also possesses the Wisdom Eye which is infinite and unbounded. Yea, his Wisdom is so Self-perfected that it far transcends the mental capacities that all creatures and gods can grasp. Resplendent also is his mental concentration wherein he has an omniscient stamina. This Royal-Stamina is likened unto that of an immovable Elephant. The majestic-roar of his voice unto that of a Lion; indeed, when he reclines between the twin sala-trees he does so on his right side like the majestic Lion of the forest. It needs to be stressed that in this fashion Buddha’s are not some psycho-physical beings, but rather highly awakened and spiritually charged supra-beings—emanating not from a fleshy, but rather a [spiritual womb, albeit housed in sentient beings]. Hence Buddhas are wholly-spiritual in essence—Spirituals, NOT Homines. It follows, then, that Buddhas are indwellers of the dharmadhātu and not of the karmadhātu; as The Dhammapada in Light of the Unborn specified, “Being bestowed with the Element of Truth is the ultimate ecstasy as well as dukkha’s demise”. All former karmic ties and associations are now rendered void. That is the soteriological import—put on the Unborn Buddha-Mind and make no further provisions for the flesh. 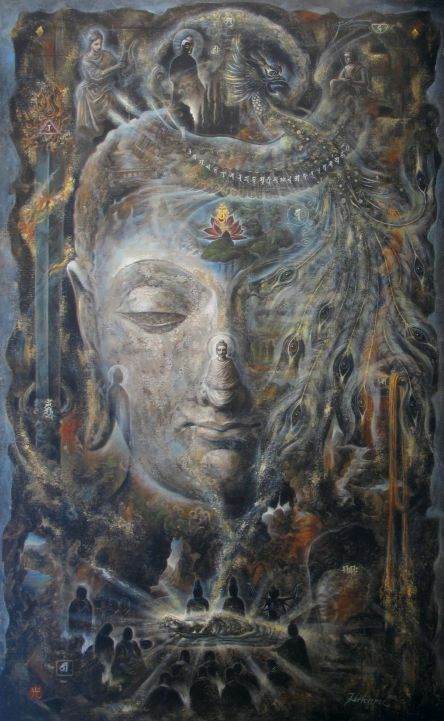 The Buddha’s nirvāṇa— which is referred to in the sūtra as “great nirvāṇa” (mahānirvāṇa) or “great final nirvāṇa” (MAHĀPARINIRVĀṆA)— differs from that of the ARHAT. The nirvāṇa of the arhat is said to be merely the state of the absence of the afflictions (KLEŚA) but with no awareness of the buddhadhātu. 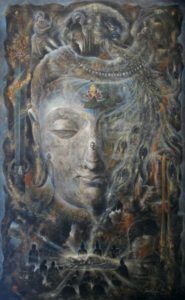 The nirvāṇa of the buddha is instead eternal, pure, blissful, and endowed with self, a primordially existent reality that is only temporarily obscured by the kleśa; when that nirvāṇa and buddhadhātu are finally “recognized,” buddhahood is then achieved. Buswell Jr., Robert E.; Donald S., Jr. Lopez. The Princeton Dictionary of Buddhism (Kindle Locations 38232-38241). Princeton University Press. Kindle Edition. This entry was posted in The Mahāparinirvāṇasūtra and tagged Dharmakṣema, Docetic-Factor, Faxian, Icchantikas, lokottara, Mahaparinibbana Sutta. Bookmark the permalink.